Spring has arrived and the fishing has been great. In the last month we have caught just about every species that can be caught in our area. Fishing inshore of St Pete Beach we’ve caught trout, redfish, snook, spanish mackerel, bluefish, jacks and pompano. My charters have been catching fish on live shrimp and sardines, but also we are having good catches on soft plastic jigs. Fishing the flats and fishing the canals has produced great action morning and afternoon. Out in the Gulf, off Madeira Beach the fishing has been great as well. Using live shrimp on the bottom we have had good catches of sheepshead, flounder, snapper and grouper. 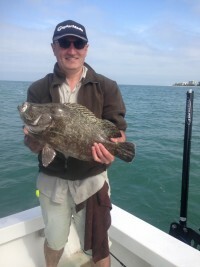 While running from spot to spot in the Gulf we have come across some really nice triple and on a few occasions we have spotted big schools of black drum migrating down the coast .